Fun and pampering, our Ultra Conditioning Bath & Shower Jelly lathers into a creamy foam and conditions as it cleanses to leave skin looking and feeling soft and healthy. This was the first thing that caught my eye, from the CocoaShea Collection. I didn’t even know what it was, but I was instantly drawn to it! I’d never seen anything like this at Bath & Body Works before. In fact, it looked more like something you’d find at a Lush store. I mean, Bath & Shower… Jelly? 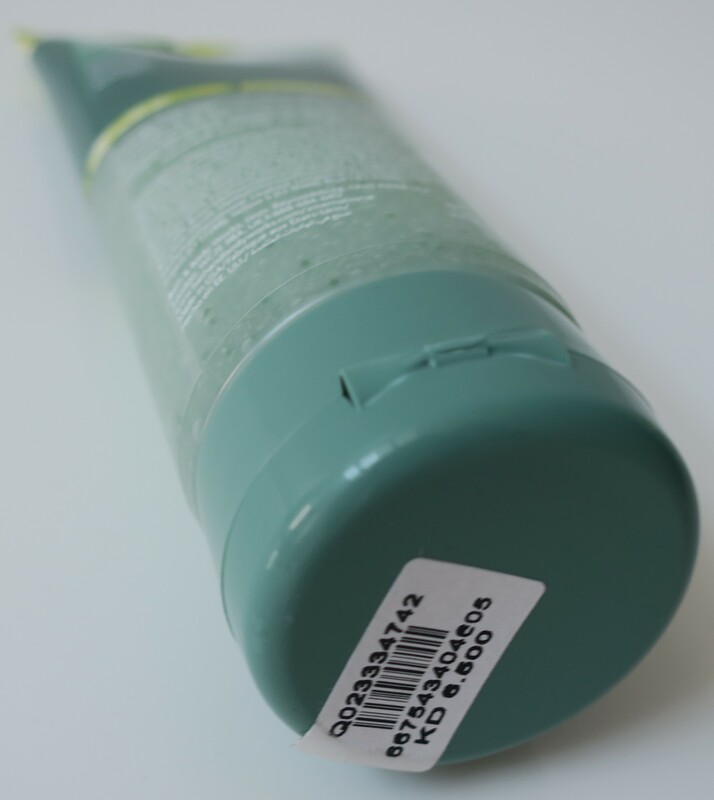 To quote Tina Fey’s character on 30 Rock, “What the what?” I was a bit wary of the fact that part of its name included the words Ultra Conditioning (which usually means some sort of “hydrating” residue, which also happens to be a pet peeve of mine). However, I was very intrigued by the Jelly texture. 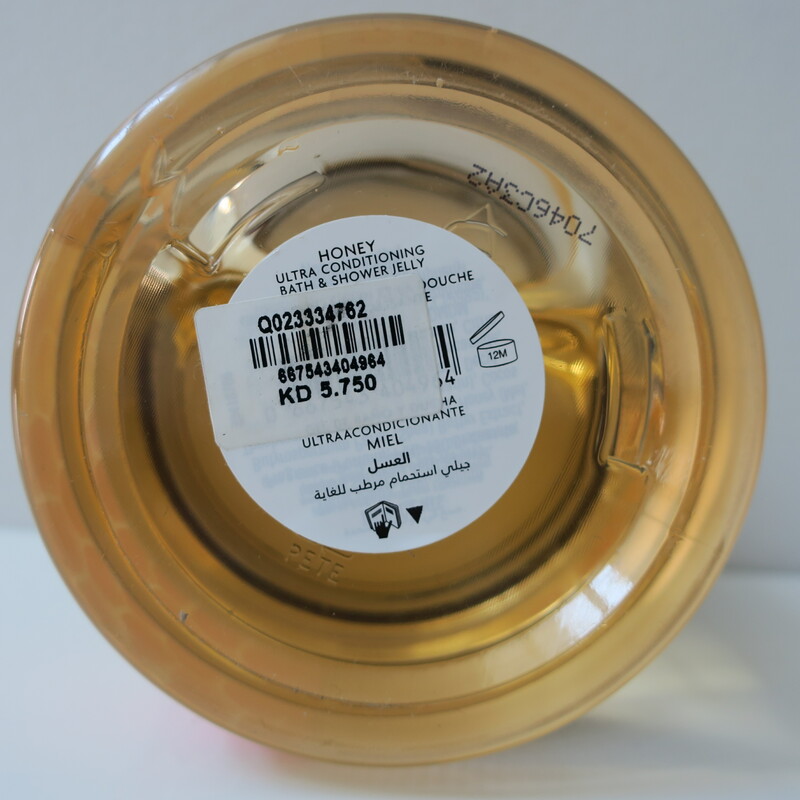 I also really liked the fact that the product actually looked like Honey! Plus, the plastic tub was clear (so you could see how much was left of the product inside) and even had a sticker depicting a honeycomb (cute! ), going all the way around the tub! Despite what it looked like in the tub, this stuff was not quite as runny (liquid-y) as I had initially feared. It was slightly more solid, but also very squishy, so… pretty much, Jello. In fact, to use the stuff, you had to gently squish it in your hands, under running water, for it to foam up. Just as advertised, it had a “rich lather” to it, and did in fact foam up wonderfully! I suggest grabbing a small amount, if you wanna’ avoid ending up with runaway chunks of Bath & Shower Jelly, because this stuff isn’t as easy to control (has a mind of its own). Still, the jelly texture was so fun to play around with, if not straight up addictive! This stuff did leave a very slight hydrating residue (even after some very thorough rinsing), but I use a regular Shower Gel beforehand, ensuring my body is sufficiently clean, before playing around with the Bath & Shower Jelly. The hydrating residue is less noticeable after I pat my skin dry with a towel and actually serves to make my skin feel slightly softer (imperceptibly so) to the touch, which is why I tend to use the Bath & Shower Jelly towards the end of my shower (when I’m almost done with everything else). As an added bonus, the Bath & Shower Jelly is rich enough to double as a Shaving Foam! In fact, I’ve used it twice already, to shave my legs. Best of all, the Bath & Shower Jelly has an absolutely glorious Honey scent (much nicer than the one from The Body Shop), that aside from filling up the entire bathroom while you shower, also tends to linger on the skin afterwards! On the practical side, this stuff both cleanses and moisturizes your skin, while also doubling as a shaving foam. On the impractical side (but equally as important), this stuff is so fun to play around with (the texture is everything!) and smells amazing to boot! 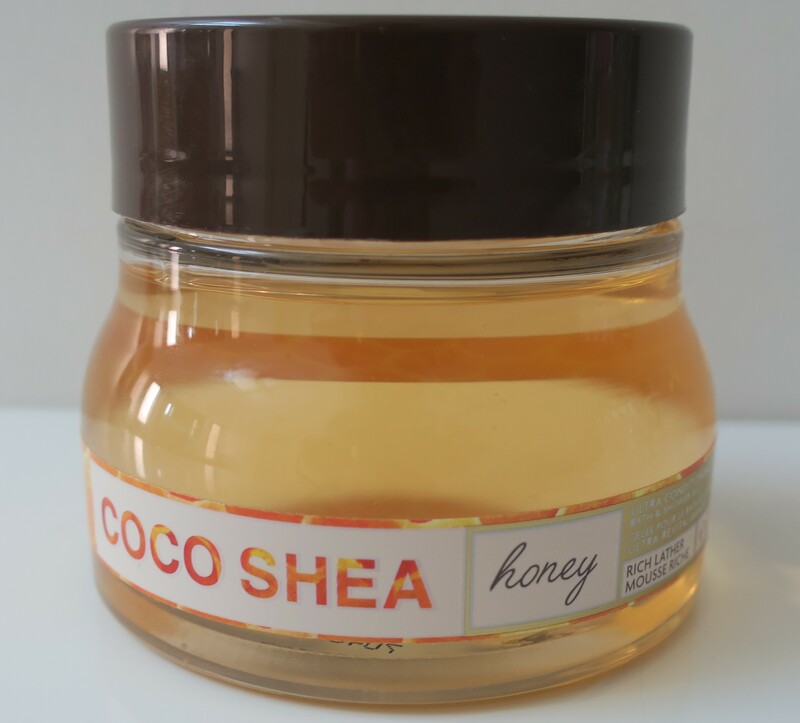 I totally recommend you give the CocoaShea Ultra Conditioning Honey Bath & Shower Jelly a try! Alcohol-free and non-drying, our Really Refreshing All-Over Mist instantly refreshes and conditions to leave skin feeling beautifully revitalized and lightly scented. I’d never seen anything like this All-Over Mist at Bath & Body Works before either. I mean sure, they sold Fragrance Mists, Hair Mists, Bronzing Mist, and even a Hair Bronzing Mist at one point. However, this All-Over Mist could actually be used on your face (in addition to the rest of the body)! It was Alcohol-Free. Plus, it had Cucumber Water in it, which is pretty beneficial to the skin! After making sure that I didn’t mistake Aloe Vera for Cucumber (like the last time, here), I grabbed one of the All-Over Mists for myself. These things don’t come with a cap. It doesn’t really bother me because I wasn’t planning on taking it anywhere with me, but I just thought it was worth mentioning. 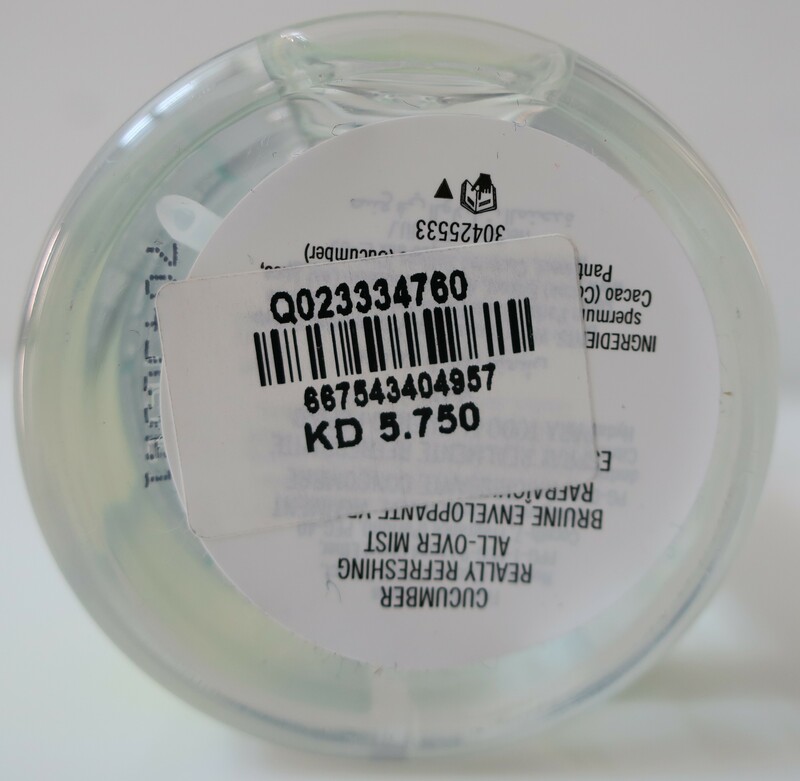 Once you remove the little tab (that stops you from pressing down on the atomizer and spraying it), there’s nothing to guarantee that this stuff won’t accidentally leak in your gym bag or wherever (if anything happens to press down on the atomizer while it’s still in the bag). What I’m saying is these All-Over Mists aren’t exactly the most portable (travel-friendly, easy to lug around, etc…) but it’s not impossible, especially if you’ve got smaller side pockets in your bag (shielding them from the rest of your stuff). The Really Refreshing All-Over Mist sorta’ spits at you, not unlike MAC Fix+ (hauled here). The mist is slightly more spaced out (not all concentrated in one area) than the MAC Fix+ but they’re pretty much the same. Unlike the Bioderma Moisturising anti-UV Mist (hauled here) which is a really, really, really fine mist, the Really Refreshing All-Over Mist practically drenches you, after only the second spritz. There is no way to control it. Press down too slowly, and you end up with a trickle of moisture dripping down. Press down at a normal speed, and it actually spits at you. The only thing you can do is hold it as far away as possible, before spritzing your face, so you don’t end up getting drenched. Despite the fact that this stuff does not contain Alcohol, it actually dries pretty quickly. I was planning on using the All-Over Mist during Spring/Summer but I’ve actually taken to using it during Winter, as I’ve found it to be quite refreshing! Hear me out. Between the cold and dry weather outside, and indoor heating everywhere else, practically zapping your skin of any moisture, not to mention the hot showers to warm up at night, your skin is bound to dry out. Now I’m not saying this All-Over Mist replenishes that moisture, in any way. I’m just saying it feels… nice. Your skin will feel all light and airy, like when you just get out of the shower! 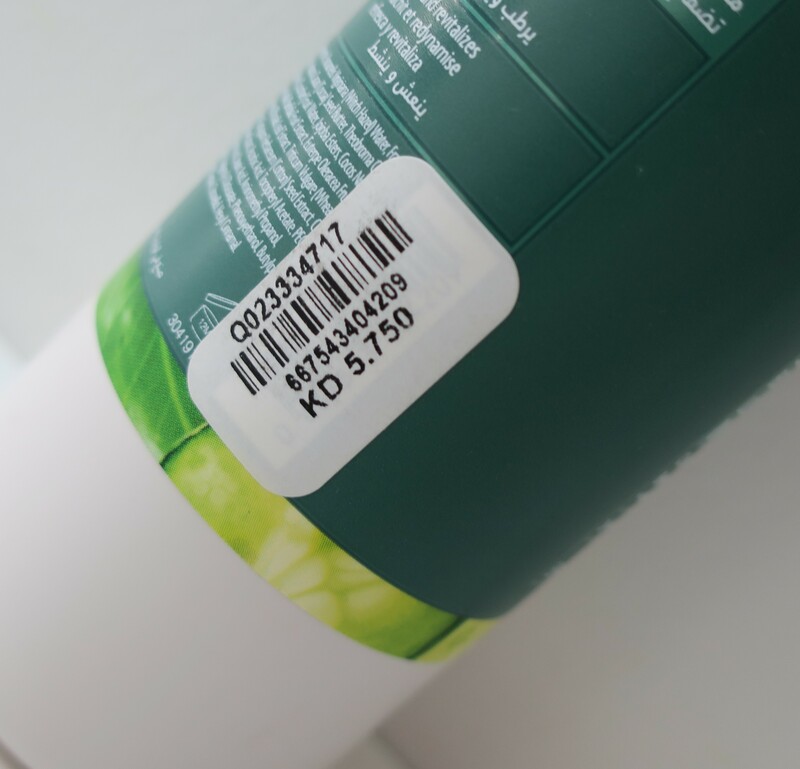 Plus, it has a refreshing Cucumber scent (more fragrant than the MAC Cucumber Fix+) that plays up to the whole “beneficial to your skin” thing! I’m not sure how the All-Over Mist performs over other skincare (moisturizers, serums, etc…) or over makeup for that matter (not so much as a setting spray, as much as a finishing spray, that sorta’ blends everything together, giving it that seamless look), but I’m sure you could use it in those ways too. On the practical side, it can hydrate dry skin during both Winter and Summer, work as a quick and refreshing pick-me-up during unbearably stifling weather, prolong your tan, work as a Finishing Spray over your Makeup, or even as a final touch over your Skincare, just to name a few uses. On the less practical side, it’s fun to use because it looks like something out of an Apothecary (due to the packaging) and it smells absolutely delightful! 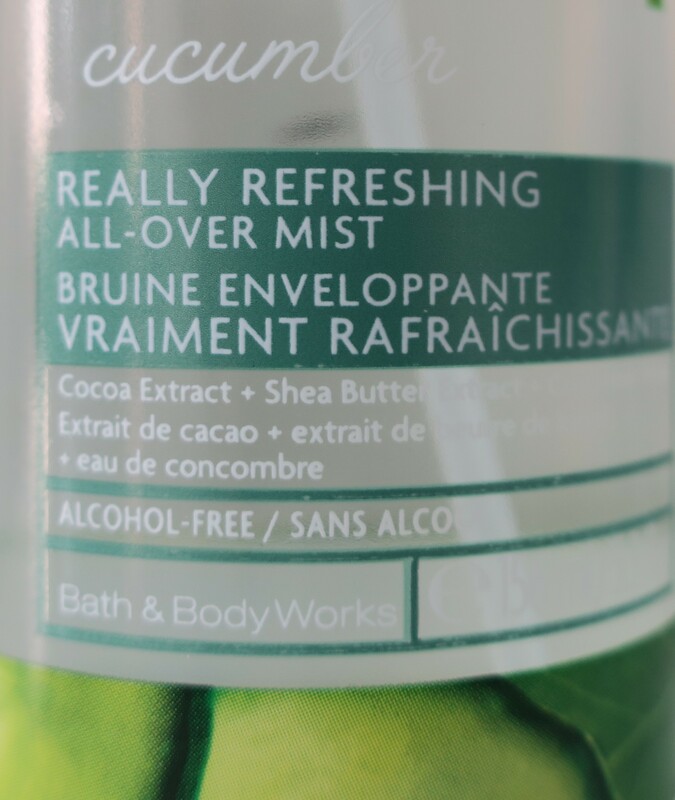 Is the CocoaShea Really Refreshing Cucumber All-Over Mist a must-have? Not really. I believe it’s more of a nice-to-have. Personally, I’ve really been enjoying using this refreshing cucumber-scented All-Over Mist but I don’t believe that it’s for everyone (not everyone would enjoy it as much as I did). Glean from that what you will. With 24-hour moisture, our Seriously Soft Body Lotion leaves skin feeling nourished and drenched in hydration. I didn’t really need yet another Body Lotion but it was either this stuff, or something else from the CocoaShea Collection (to qualify for the Buy 3 Get 3 Free Deal), and I wasn’t in the market for another Gel Lotion (too light), Body Butter (too heavy), Body Oil (too messy), or Creamy Body Wash (“hydrating” residue = pet peeve) so I decided to go with the Seriously Soft Body Lotion. I gotta’ be honest, the fact that it actually had Seriously Soft in its name, played a huge role in my reasoning for purchasing this stuff. You name anything Seriously Soft and I’m definitely going to be all over it. 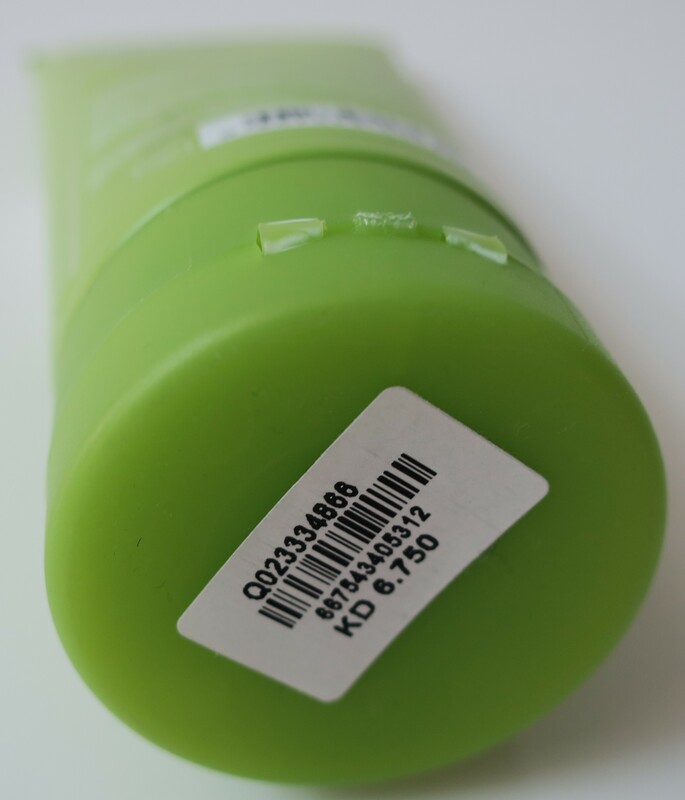 The Seriously Soft Body Lotion was available in Cucumber and Honey and Coconut. I figure since most of the stuff I got from the CocoaShea Collection was cucumber-scented, might as well keep the theme going. Plus, it helps with layering, of which I’m a huge fan. Again, no cap on the container. However, it did include a lock mechanism (just twist to the side, to lock in place, preventing it from being pressed) which was convenient. The packaging looked pretty boring but whatevs. I was more interested in the product’s performance and perform well, it did! 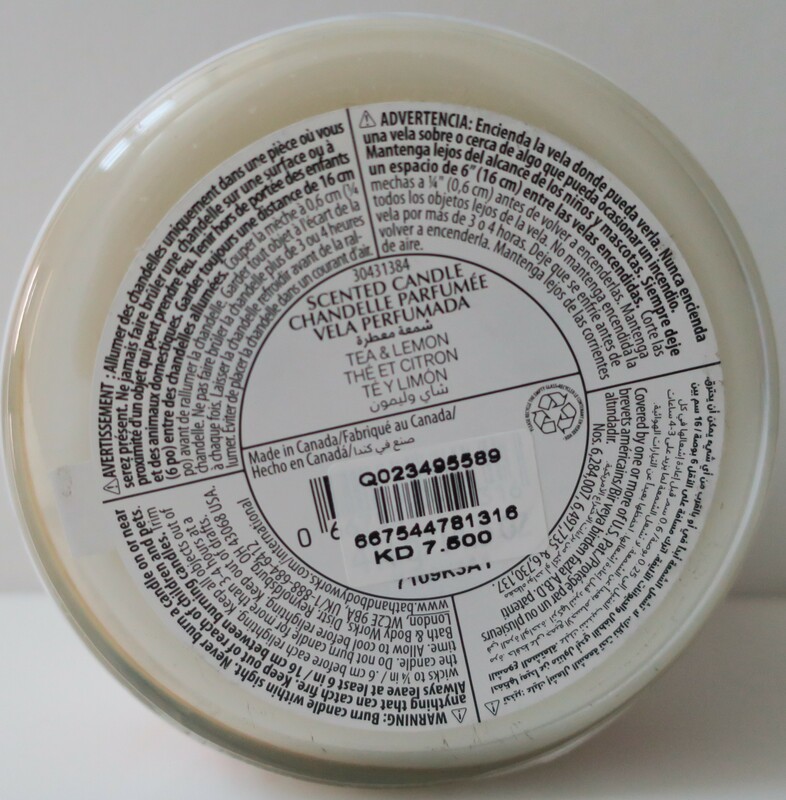 It applied like a regular lotion, absorbed quickly, and left my skin feeling Seriously Soft! In fact, it performed so well that it kinda’ reminded me of my secret weapon to having the softest skin ever, Jergens Moisturizer (reviewed here), except the Jergens Moisturizer had a much nicer fragrance. At first, the Cucumber Body Lotion smells all nice (like cucumbers mixed in with something sweet), but it quickly turns into something more earthy, and ends up making you smell like a salad. In hindsight, I should’ve gone for either Honey or Coconut, instead of Cucumber. 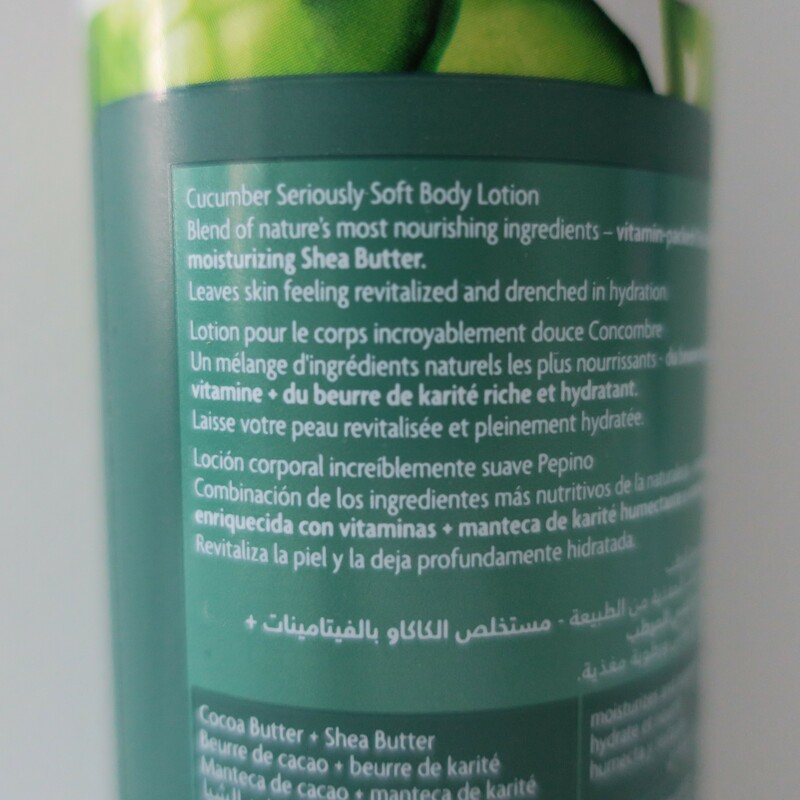 Regardless, the CocoaShea Cucumber Seriously Soft Body Lotion made my skin feel… seriously soft (as promised)! Keep in mind that it’s not a heavy-duty moisturizer, so this might not work for those with problematic dry skin. However, if super soft skin is what you’re after, I totally recommend you give the CocoaShea Seriously Soft Body Lotions a try (just make sure to do a test run of each of the scents in-store, before making your purchase). With smoothing Pumice and a Cleansing Gel Formula, our Really Refreshing Foaming Scrub leaves skin feeling revitalized and totally touchable. 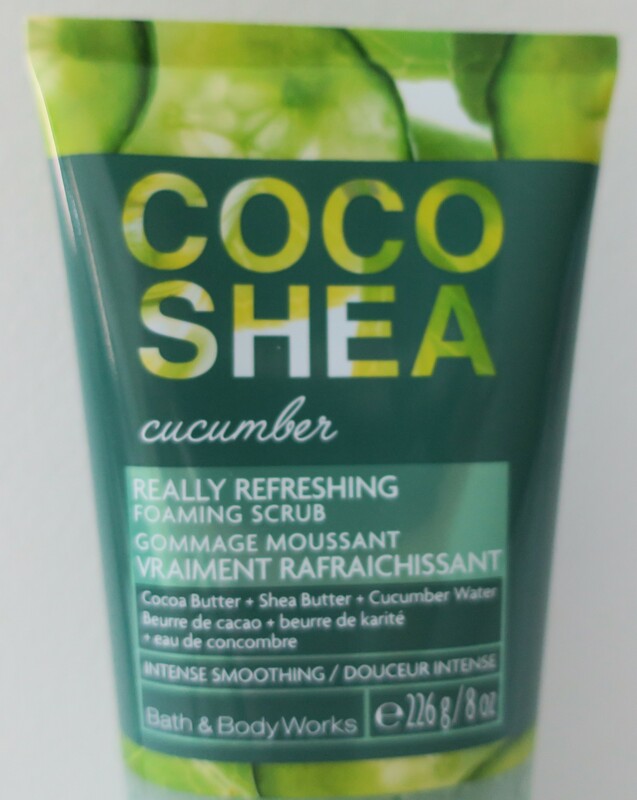 My favorite thing out of this entire haul, the CocoaShea Cucumber Really Refreshing Foaming Scrub! This stuff is amaze! Where do I even begin? The packaging is lovely! It’s got different shades of green, that’s pleasing to the eye! It’s transparent too (so you can visually keep track of how much you’ve got left before it runs out), which is quite practical. Plus, I personally get a kick out of seeing all those little scrubby bits, showing through the transparent packaging on Body Scrubs. There’s something about being able to see them, through the packaging, or even in my palm, that I just find to be fun super appealing! Most important of all, the flip-top closure (at the bottom) opens and snaps shut, without any faulty packaging misalignment issues, and remains securely shut in place. As you can hopefully tell from the photo, the Foaming Scrub has 2 kinds of scrubby bits suspended in the green gel; the first being the white, grain-y, and sand-like pumice, while the other was the darker green, plastic, exfoliating beads. So for those with sensitive skin, steer clear, because those plastic exfoliating beads will do you no favors. Personally, I like to exfoliating my skin into submission, so the rougher, the better. As for the green cleansing gel, it foamed up immediately (and beautifully, I might add), upon contact with water! It lathered up excellently as well! I love, love, loved the consistency of this Foaming Scrub! Between the cleansing gel, and the rough and gritty scrubby bits (pumice and exfoliating beads), my skin was thoroughly cleansed, buffed and polished to perfection! If all that wasn’t enough, the Really Refreshing Foaming Scrub had an insanely delicious scent! It was all I could to stop myself from drinking the stuff (because it’s frowned upon, and you know… poisonous). It smelled like cucumbers mixed in with something sweet. In fact, every time I’d use this stuff, I’d start craving Watermelon Juice (I’m actually sipping on some right now), so I’m guessing the “something sweet” is probably some sort of melon (sugar melon, mayhaps?) that just elevates the scent from being pleasant to wonderful, nay, glorious! The Seriously Soft Body Lotion starts of with the same wonderful scent, just like the Really Refreshing Foaming Scrub, but turns into a salad-like smell shortly after, whereas the scent of the Really Refreshing Foaming Scrub remains delightful throughout. If nothing else, get the Foaming Scrub for the scent alone (it’s worth it… or should I say, YOU are worth it)! 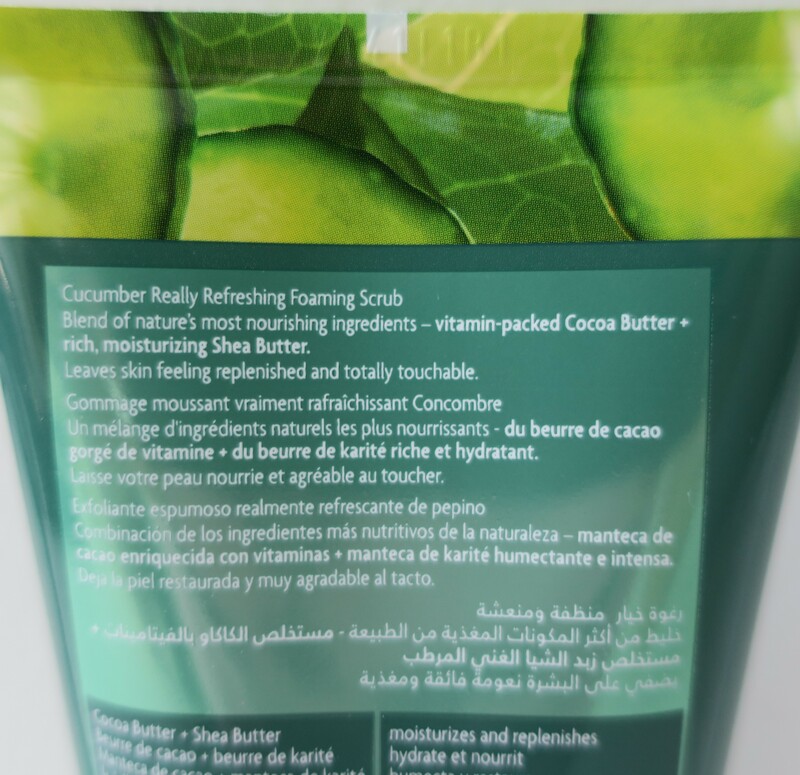 The CocoaShea Cucumber Really Refreshing Foaming Scrub foamed up beautifully, lathered up wonderfully, cleansed my skin thoroughly, exfoliated my skin efficiently, and smelled simply divine while doing all that! Our skin-smoothing Clay Body Scrub gently exfoliates and comforts the senses with an aromatic blend of fragrance. Enjoy real benefits from good ingredients including natural oils, detoxifying white clay and rich volcanic minerals. By now, we’ve already established that I’m a sucker for any and every Body Scrub known to man. As such, I couldn’t resist picking up yet another Body Scrub, a Clay Body Scrub! Unlike most of the stuff in this haul, also as evident by the packaging, the Clay Body Scrub was not part of the CocoaShea Collection. I’m not even sure which collection it was from, but I had to have it because it legit had Green Apple in its name (obsessed with all things Green Apple)! Granted the actual name was Jasmine & Green Apple but let’s focus more on the Green Apple part. The Green color of the packaging fit in nicely with the Green Apple theme. This has nothing to do with anything, but the packaging also strongly reminded me of the cover of the John Green novel, “The Fault In Our Stars” (never read the book, only bawled my eyes out during the movie). Once I flipped it over, and read the blather on the back, I was sold! First of all, the fragrance notes included scents that I was not only familiar with, but also completely smitten by; Dewy Honeysuckle and Crisp Green Apple and Natural Jasmine Extract. Despite my aversion to most florals, I’ve discovered that I simply adore the scent of Honeysuckle as evident by my past purchases of Bath & Body Works Honeysuckle Scented Candles and Bath & Body Works Honeysuckle Wallflower Refill Bulbs (here and here). I find Honeysuckle to be an absolutely delightful, delicate, fresh, and most of all, clean floral scent! As for Green Apples, they happen to not only be my favorite fruit, but also one of my most loved scents ever! Here’s just some of the the stuff I’ve purchased, that smelled like Green Apples, from Bath & Body Works (Apple Blossom Citrus) from Victoria’s Secret (Beauty Rush – Appletini and Pink – Fresh & Clean) from The Body Shop (Limited Edition Holiday Collection – Glazed Apple) to Lip Balm (The Body Shop Glazed Apple Lip Balm and Alshaya Apple Fruity Lip Balm and Green Apple Chapstick) to Hair Care (Boots Fresh & Crisp Apple Shampoo and Conditioner and Head & Shoulders Green Apple Shampoo) and a Candle (Ikea Green Apple Candle). When done properly (not overly synthetic or sweet) Green Apple-Scented products are everything (they give me life)! Finally, we come to the Natural Jasmine Extract. I, absolutely cannot stand the sickly sweet scent of Jasmine in its natural form (as a flower), because somehow it comes across smelling like a sewer (at least to my nose). However, many of my well-loved perfumes contain some form of Jasmine (a more palatable form, I might add), but my favorite by far has got to be Bvlgari Jasmin Noir L’essence (reviewed here). What with the Honeysuckle and Green Apple and Jasmine, the end result of this Clay Body Scrub was a surprisingly familiar scent (also from Bath & Body Works). I no longer own it to compare or even confirm, but I believe the Jasmine & Green Apple Clay Body Scrub smelled exactly like any number of products from the Beautiful Day range (hauled here and here). It’s not a bad scent at all. It’s a nice, fruity-floral (Green Apple + Jasmine). It’s just… I was expecting something nicer. Don’t get me wrong. The scent is fresh, crisp, and most importantly, light (inoffensive). It’s the floral part that bugs me (I can’t stand most florals). I think most people (who aren’t insane, like I am) might enjoy the scent of the Jasmine & Green Apple Clay Body Scrub. The back of the packaging also mentioned Detoxifying White Clay and Rich Volcanic Mineral, both of which made me perk up, and immediately toss the thing in the canvas shopping bag (that they hand out at the entrance), with the rest of my to-buy stuff. For the longest time, my MAC Mineralize Volcanic Ash Exfoliator (reviewed here) was pretty much my favorite thing ever! Lack of availability (always out of stock, never knew when and if they were gonna’ bring ’em back) and the fact that it made such a huge, black mess in my shower, kinda’ made me fall out of love with the stuff. As such, I’m pretty much ecstatic over the fact that this Clay Body Scrub is actually white (less messy)! Plus, who wouldn’t want to use Detoxifying Clay on their body? I mean, doesn’t that just sound good? I’d pretty much try anything that has some variation of the word Volcano. You add the word Clay to the mix, Detoxifying Clay at that, and I’m definitely purchasing it! 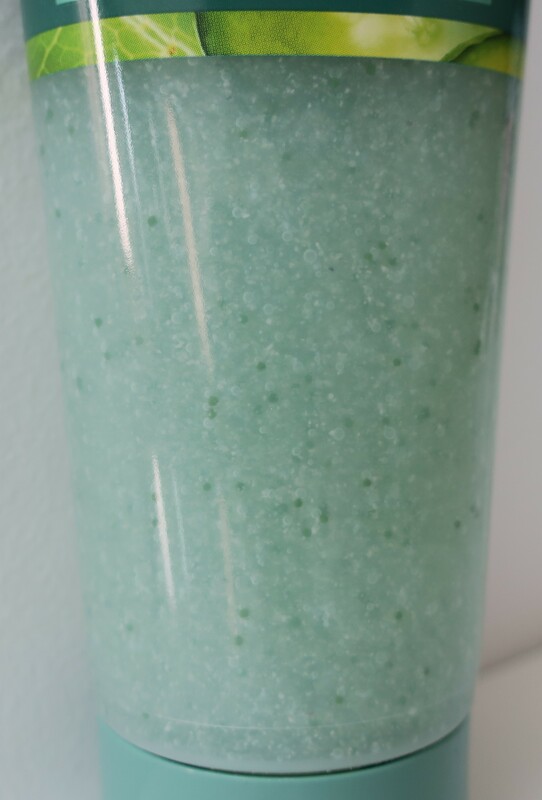 The Jasmine & Green Apple Clay Body Scrub performed just as well as the MAC Mineralize Volcanic Ash Exfoliator (reviewed here), if not better! They both had a paste-like consistency but the Volcanic Ash Exfoliator had a higher viscosity than the Clay Body Scrub. Unlike the Volcanic Ash Exfoliator that contained Sugar Crystals, the Clay Body Scrub didn’t immediately melt upon contact with water. It just formed a nice lather, not quite frothy and bubbly as the CocoaShea Cucumber Really Refreshing Foaming Scrub, but thoroughly cleansing just the same. This stuff was saturated with extremely gritty scrubby bits, yet was somehow quite gentle as well (basically… witchcraft). You could use it on your elbows, knees, ankles, etc.. the areas that can handle a little extra exfoliating attention, but it was also gentle enough for use on the more sensitive areas of the body. Heck, you could even use it on your face, if you wanted. A little bit of this stuff really does go a looong way. Alls you gots to do is figure out the proper Scrub to Water ratio, and you’re golden. Due to this stuff being saturated with little scrubby bits, you won’t have to deal with it skipping over random areas of the skin. 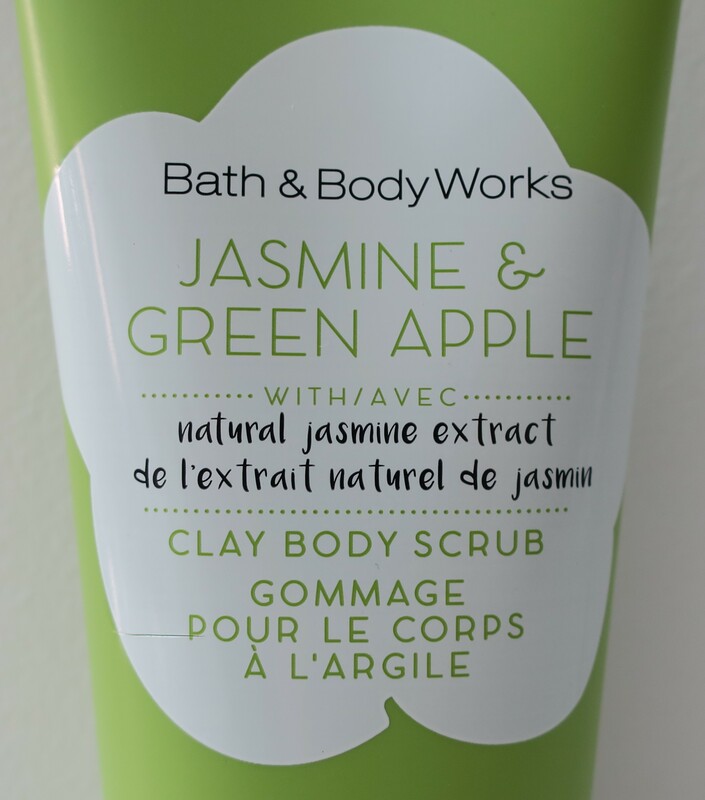 The Jasmine & Green Apple Clay Body Scrub will exfoliate your skin thoroughly, and more importantly, evenly! All in all, I’ve really been enjoying using this stuff. The Jasmine & Green Apple Clay Body Scrub is amazing at (brace yourselves) sloughing off layers of dead skin! Using this stuff… literally unveils a new you! My skin feels lighter and actually looks brighter after I use this stuff. Not sure about the Detoxifying aspect (I’m a sucker for gimmick-y products) but at the very least, it triggers the Placebo Effect (where you think it’s doing something, even though it’s not really doing anything) which makes me happy, either way. Plus, it’s got a nice, crisp, fruity-floral scent that’s slowly growing on me. Basically, I’m blown away by the Jasmine & Green Apple Clay Body Scrub, based on the consistency alone! Definite must-have! I like Tea (here and here). However, I’ve recently discovered that I absolutely love the smell of Tea, based on the Givenchy Ange Ou Demon Le Secret Elixer Perfume (reviewed here)! Toss in some Lemon and Sugar Cane notes, and you end up with a scent that’s straight out of some sort of high-end Spa! I found the Tea & Lemon scent not only incredibly relaxing, but damn near euphoric! Heck, I’d even go so far as to call it a “spiritual experience”… in a Candle! The scent was so next-level, it was practically transcendent! Don’t take my word for it. 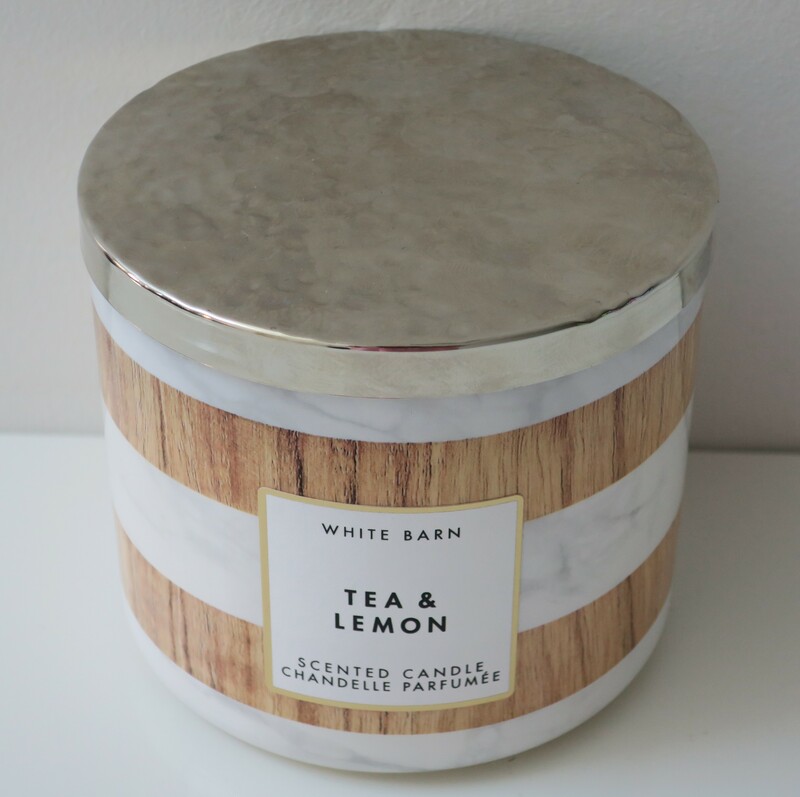 Go (or run, your choice) to your nearest Bath & Body Works store and give the White Barn Tea & Lemon Scented Candle a sniff. Take note of how you write it off as nothing special… at first, but then after roaming around the store, you go back and give it a second sniff, and you think “Oh it’s not bad actually” before setting it down again, and eventually finding yourself habitually sniffing the Candle over and over again, until you finally plunk down the cash and just buy the darn thing. Just me? Fine. Anywho, the packaging looked pretty cool, with panels of light wood and white marble going all the way across, but then I noticed how it was somewhat see-through from the inside, which made the whole thing look… cheap. That’s okay though, because like I said, the scent was gorgeous! Even the cold throw on this thing was excellent! Every time I got a whiff of the Tea & Lemon Candle, it conjured up images of a spacious, old-school library (we’ve already established that I’m insane so just go with it) and from the neck up, I was decked out like Quistis (from Final Fantasy VIII), complete with the glasses (not sure what my deal is with glasses), as I ruled over my library kingdom with a firm but fair hand. 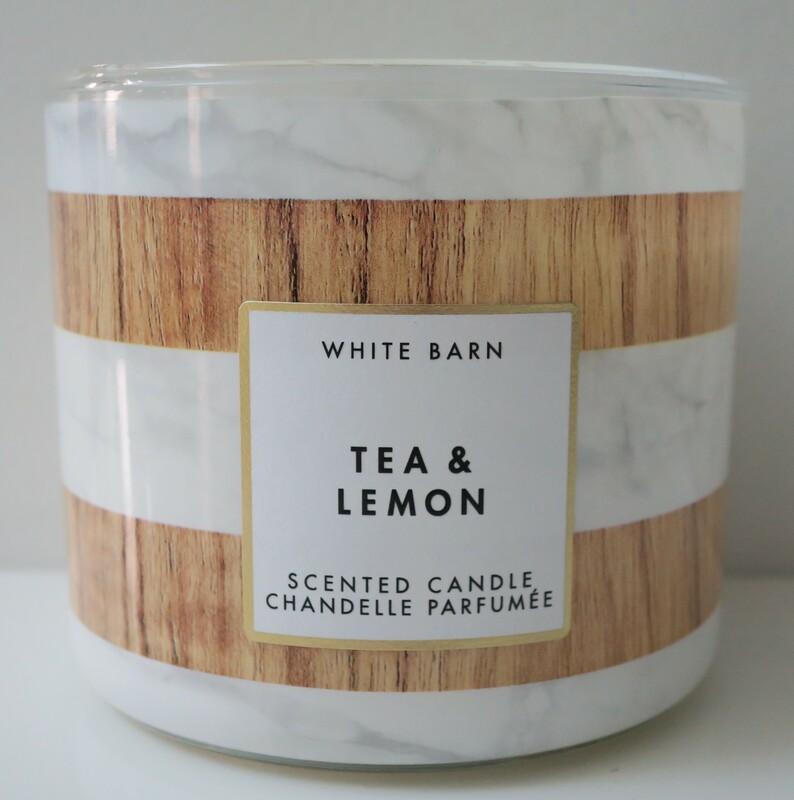 Everyone else (non-crazy people) around me, who’ve had the honor (highest of honors, I might add) of giving the Tea & Lemon Candle a sniff has declared, “Spa”, almost instantly. Both the Tea and Lemon notes are equally prominent, as neither one overpowers the other. I believe Tea & Lemon was previously released under the name London and later London Calling, as part of the City & Travel Collection, meaning if you missed out on it then and again now, chances are they’re probably going to re-release it at some point down the line. 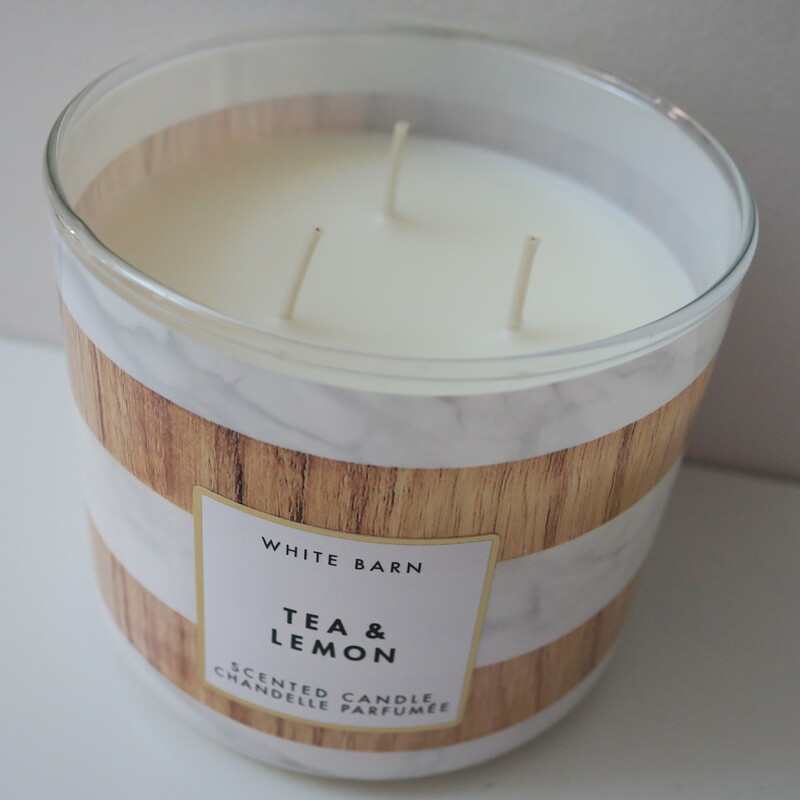 Scents are a matter of personal preference but Tea & Lemon seems like one that a lot of people could appreciate. Personally, I love it! As you can see from the receipt, I only had to pay for the 3 higher priced items (Candle and both Body Scrubs) and got the other 3 items (Jelly, Mist, and Lotion) for free, due to the Buy 3 Get 3 Free promo, that they had going on at the time. It was a pretty good deal actually, hence the lack of quotations marks around the word deal. 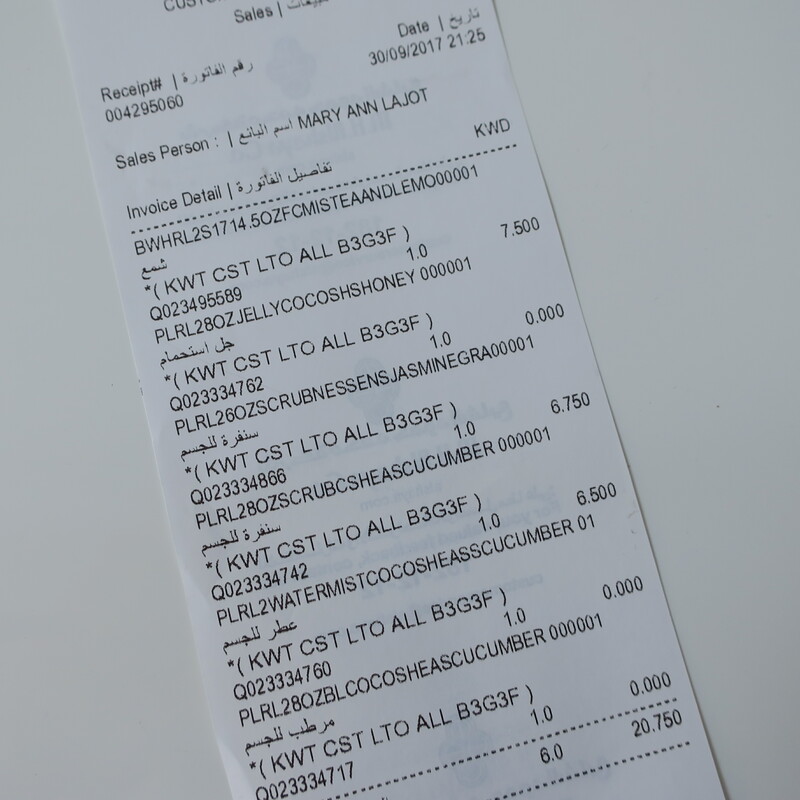 Instead of paying KD 38 I ended up saving KD 17/250 and only had to pay KD 20/750. Like I said earlier, I’m pretty happy with the products I got, because they performed pretty well, and most of them smelled great while doing it!